I am thrilled to share an interview and tutorial over on Sarah K. Benning’s blog and series, Craft with Conscience. 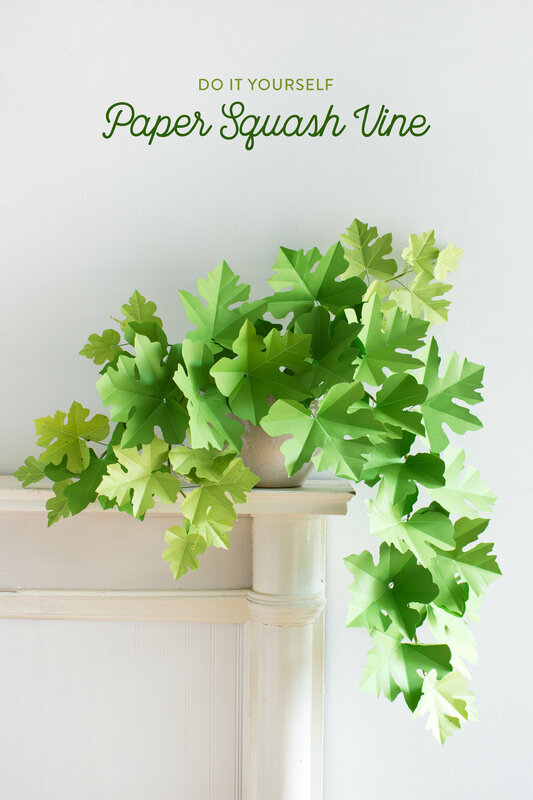 Learn how to make this paper squash vine, just click over to her site for the instructions. This beauty, the Miss Muffet caladium, is ready for you over on Sugar and Cloth! Click on over to Design*Sponge for this tutorial! In celebration of the release of my new book, Handmade Houseplants, I am thrilled to be back on The House That Lars Built! Head over there to learn all about how to make this tree! Yes, I finally tackled one of my all time favorite plants, the Japanese maple! This one is based on the Shirazz variety! You can make a small tree like I did, or just a branch or two to place in vases! Happy crafting! It's so hard to believe it's Christmas time again! I'm excited to share will y'all this year's holiday craft! It's a paper Christmas cactus and you can find all the details and patterns over on The House That Lars Built! Just in time for Halloween! Learn how to make a paper plant hat on The House That Lars Built! It's a botanic bonnet! Quick to make and comfortable too! Happy Halloween and happy crafting! For a few months now, I haven't been able to get out of my head the idea of making a cactus vase! I had been hoarding paper towel and toilet paper tubes and finally sorted out what to do with a few of them! Monstera obliqua, the charming swiss cheese plant is now in PAPER! Yes! This is a fun one to make. You find find the full tutorial over on The House That Lars Built. The watermelon peperomia, an all time favorite of mine, is such a beauty! Just look at those watermelon stripes! I put together a tutorial to make her out of paper! You can find the how-to over on The House That Lars Built! Five months after my first paper pilea perperomioides (a.k.a. Chinese money plant), I've had so much fun making many more. I thought it was time for an update on the DIY! Here you will find a tutorial for a more realistic interpretation of the popular plant and more detailed instructions. Just in time for spring! Learn how to make these linoleum block print tulip napkins over on The House That Lars Built! On my last trip to Ikea, I spotted a set of inexpensive drawstring bags. At the time, I had just returned from traveling and had been thinking about how I'd like to have a better way to organize my suitcase. I took the bags home and decided to make them a little cuter. I printed a simple prickly pear cacti garden along the bottom! The next time I travel, I'll use 'em for shoes or socks or dirty clothes. They are light weight, so they are great for helping with organizing without adding more bulk or weight to my bag. Plus, now they are covered with cacti.... one of my favorite things. You can do the same! Read on to learn how. The Peruvian maidenhair fern also known as the silver dollar fern is a long time favorite of mine. It can be easily translated into paper! A Pajaki inspired St. Patrick's Day chandelier! Why not? Melting pot, right? This one is for all my Polish-Irish friends! No sew, no fray, no 'fancy' nothing! This lampshade is easy y'all and you can use just about any fabric - you only need a half a yard! Get the full tutorial over on The House Lars Built. This year, I have finally decided to participate in the NYC Easter Parade and Bonnet Festival! How fun! A prickly pear cactus makes a great bonnet, don't you think? Make this modern and bold wood block trivet! Easily dress up and protect your table or make one as a gift. Today is the coldest day in NYC in the last 20 years! I'm opting to stay inside all day and play this Valentine's Day inspired DIY checkerboard! You can make one too, read on to learn how! Happy Valentine's Day!! Nothing is quite so sweet as a slice of watermelon! Even though its the dead of winter and we have over two feet of snow here in Brooklyn, my mind is already on the delicious fruits of summer. Meet the watermelon Valentine! Photography and tutorials by Corrie Beth Hogg. All content © Corrie Beth Hogg, unless otherwise stated. Please credit accordingly.